Dig Dinosaur Fossil Replicas Skulls in Sand. Great activity for kids loving dinosaurs. Prehistoric skulls are hand painted, authenticated by the paleontologists of Museum of Natural History. 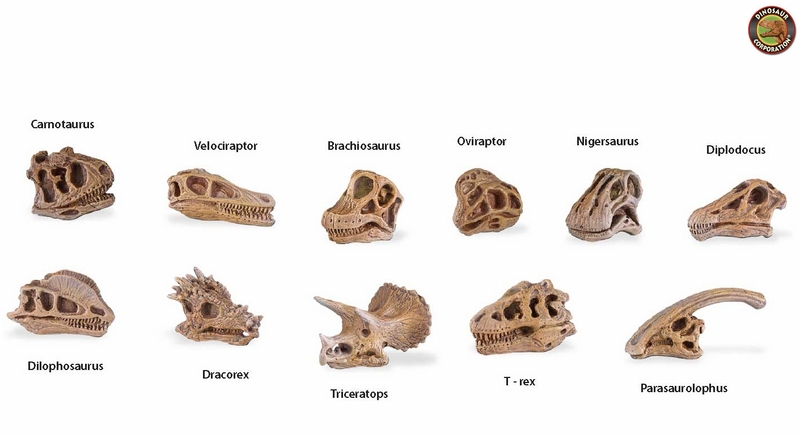 These dinosaur skulls collectibles species include: Carnotaurus, Velociraptor, Brachiosaurus, Oviraptor, Nigersaurus, Diplodocus, Dilophosaurus, Dracorex, Triceratops, Tyrannosaurus, and Parasaurolophus.